Australian Yoga Journal is dedicated to the yogi in all of us – from the beginner to the expert and everyone in between. 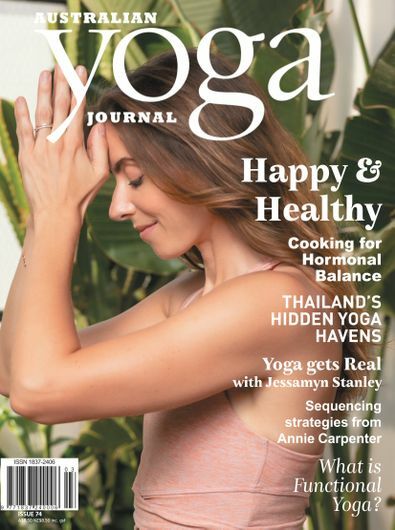 Every issue gives you access to basic yoga poses, home practice sequences, and a masterclass for advanced practitioners; guided meditations and yoga philosophy will provide inspiration and wisdom to enlighten your mind; healthy recipes and dietary tips will benefit your body; and the travel section will broaden your horizons even further. Whatever your stage, you’ll find fresh perspective, a new insight and something that is sure to resonate with you – such is the physical and spiritual benefit of yoga. Australian Yoga Journal is the new lifestyle magazine for people who love yoga. Each issue you’ll learn from some of the best teachers in the world, as well as discover healthy recipes, inspirational people and places, all you need to know for a balanced, happy life. Australian Yoga Journal is published 8 times per year.